�Margin of appreciation� permits crucifixes in Italian state schools (2011), a niqab ban in France (2014) and a general erosion of human rights. Mussolini's boasted that the Lateran Treaty would “bury” the worldly power of the pope, but it permitted just the opposite, even serving as a springboard to vault the Church into international bodies. And as a comedienne discovered in 2008, this Treaty still threatens Italians with five years in prison for a joke about the Pope. In 1871 Italy was finally unified by absorbing the Papal States. The Pope, now deposed as King of Rome, retreated behind the walls of the Vatican, where he continued to fight the Italian state with every means at his disposal. His successors remained holed up in the Vatican for 58 years, waiting for a better offer. The papal boycott finally ended when the dictator Mussolini signed the Lateran Pacts which gave the Pope an autonomous kingdom and much more generous compensation than originally offered. He excommunicated the King of Italy. He had long railed against the secular values of the Italian kingdom. In his 1864 Syllabus of Errors he had already condemned more than eighty “errors and perverse doctrines” including separation of church and state, a free press and secular education. Most Italians understood such “errors” to be presented “as a none too oblique condemnation of the Italian Kingdom”. Pope Pius IX also directly forbade Catholics to participate by way of voting or any political involvement in the workings of the “godless” Italian state. After the unification of Italy, for 58 years a succession of popes refused to acknowledge the new country that had swallowed up the papal kindom. They refused to even set foot on its soil. 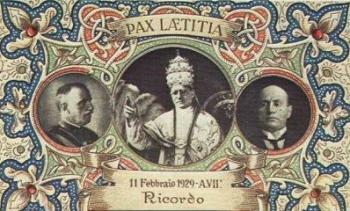 With pathos Pius IX depicted his own boycott as a tale of persecution and talked of being a “prisoner in the Vatican”. In 1929 the long wait finally paid off when Mussolini proved willing to enter an alliance with the Vatican. A precondition of the negotiations was destruction of the parliamentary Catholic Italian Popular Party. Pius XI disliked political Catholicism because he could not control it. Like his predecessors, he believed that Catholic party politics brought democracy into the church by the back door. The demise of the Popular Party caused a wholesale shift of Catholics into the Fascist Party and the collapse of democracy in Italy. A few years later the Pius would follow the same concordat strategy with Hitler to disband the democratic Catholic party there. Eliminating the Catholic Centre-right party helped give Hitler the majority he needed in the last free election before he shut down German democracy. 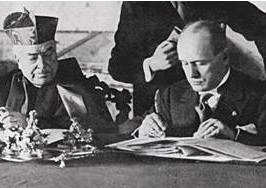 The Pacts between Mussolini and the Vatican are named after the Lateran Palace in Rome where they were signed. This palace, which adjoins the Basilica of St. John Lateran, was built by a Renaissance pope. (It still has the little pavilion on the roof to look like a good nesting site and lure pigeons for the pope's dinner.) Article 13 of the Lateran Conciliation Treaty gives the Vatican extraterritorial ownership of both the Basilica and Palace. This is a souvenir of the creation of the Vatican State by the Lateran Pacts. Its “trinity” of King Victor Emmanuel III, Pope Pius XI and Benito Mussolini celebrates the new unity of temporal and spiritual authority. This accomodation between church and state was called the “peace of Laetitia” (pax Laetitia) after the Roman Goddess of Joy. However, it helped legitimise a police state regime that by 1929 had already spread terror through military tribunals, political assassination and raids by Blackshirts. “Book and musket [make the] perfect fascist”, is one slogan from “year XI” of Mussolini's rule (1933). “Love God, country, family” is another. In recognition of the concordat, the bundle (fasces) includes a cross. Although there have been revisions, the Lateran Pacts remain in effect today. Italians are still bound by them, as an Italian comedienne discovered in 2008 after she made a joke about the Pope for his anti-gay stance. She found that she had unwittingly contravened Article 8 of the 1929 Conciliation Treaty, an offence which can bring five years in prison for public insults against the pope “whether by means of speeches, acts, or writings”. Avro Manhattan, Chapter 9, “Italy, the Vatican and Fascism”, The Vatican in World Politics, 1949. They dispute me this grain of sand under my feet. They will not dislodge me. This corner of the earth is mine; I received it from Christ; to him alone I will render it again. As the errors listed had already been condemned in allocutions, encyclicals, and other apostolic letters, the Syllabus said nothing new and so could not be contested. Its importance lay in the fact that it published to the world what had previously been preached in the main only to the bishops, and that it made general what had been previously specific denunciations concerned with particular events. Thus perhaps the most famous article, the 80th, stigmatizing as an error the view that “the Roman Pontiff can and should reconcile himself to and agree with progress, liberalism, and modern civilization,” sought its authority in the pope’s refusal, in Jamdudum Cernimus, to have any dealings with the new Italian kingdom. 3. John Cornwell, “Hitler’s Pope”, [an abridged version of his book of this name], Vanity Fair, October 1999. 6. “A holiday to celebrate the 1929 Concordat and one to commemorate the founding of the Fascist Squads replaced the ‘Statuto’, a national holiday that antagonized the Church because it commemorated the unification of Italy that had kept the Pope a virtual prisoner”. Mabel Berezin, The Festival State: Celebration and Commemoration in Fascist Italy, Journal of Modern European History, June/July 2005, pp. 14-15. This is a curiously uncritical repetition of the Pope's claim, when in reality this self-imposed confinement was part of a bargaining tactic. No one held the pope a prisoner in the Vatican. It was purely voluntary that for 59 years after losing their kingdom, the popes refused to leave the Vatican in order to avoid any appearance of accepting the authority of Italy over its former territories. 7. George B. McClellan, Modern Italy: A Short History, Princeton University Press, 1933, p. 268. 11. An excerpt of Mussolini’s speech on Lateran Pacts before the Chamber of Deputies, 13 May 1929, is printed in John Francis Pollard, The Fascist experience in Italy, 1998, p. 73. Google reprint.